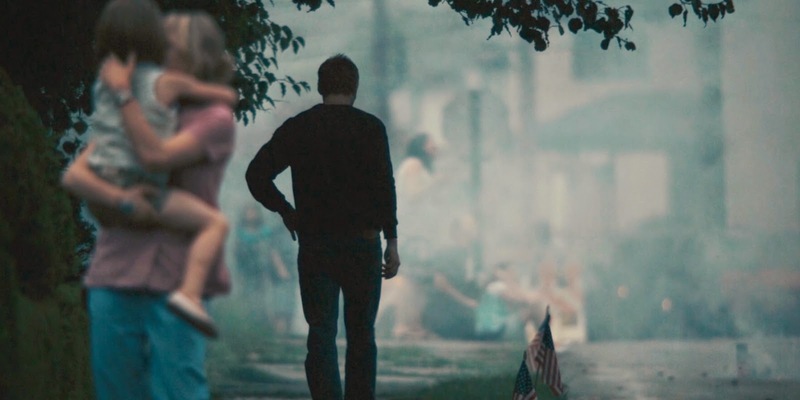 Cinematic Paradox: Can We Take a Moment to Remember How Blue Valentine is Still Devastating? Can We Take a Moment to Remember How Blue Valentine is Still Devastating? Few spoilers in this post, but I imagine most of you should have seen it back in 2011. If you haven't, grab the tissues and come back later. Did you know that the most fun thing you can do on a Sunday afternoon before you go to work is rewatch Blue Valentine and spend a good 20 minutes crying over it? Didn't know that valuable information? Well I can 100% confirm that while rewatching Blue Valentine may not be the most happy experience, it is an experience nonetheless. A little bit of context: I first watched Blue Valentine when it first came out on DVD in July 2011, when I was a tiny 15 year old enjoying the last days of illegally watching R16s. I have not been able to go back to it since. Until there came a Sunday when I thought: "I've got a couple of hours to kill, let's watch the most depressing film in my collection this side of Revolutionary Road." Apparently I didn't really remember the magnitude of absolute earth-shattering devastation that this film brought to my world. Or I was watching it with different eyes when I was 15. But holy heck is this film depressing. One thing that really took me by surprise this time around was the way Derek Cianfrance loves playing with his narratives. One of my favourite films from last year was his sophomore effort The Place Beyond the Pines. Here was a film that easily could have been split into three parts, yet he expanded his narrative beyond what he could have. He didn't only show the cause, but also showed the effect. I talk about this a lot more in my review of the film from last year, but to put it simply: I really admire Cianfrance's ambition. We're too often brushing simple narrative ambition under the rug for the more complex, confusing narratives drawing in a plethora of realms (however, that does make for some damn good cinema when it's done right). Blue Valentine is an ambitious film. Not as glaringly ambitious as The Place Beyond the Pines, but ambitious nonetheless. You couldn't really say that films about breaking/broken relationships aren't really hot topic, especially in the realm of independent film-making. Cianfrance expands his narrative here also, giving us two films in one: the film that shows the early days of the relationship between Dean and Cindy, and then also the latter days (or day, considering most of the action happens over the course of 24 hours). Instead of handing them to us in perfect chronological order to gulp down, he cross-cuts the two narratives together. Bittersweet or a bitter pill? Hmmmm. I honestly think that the way that Cianfrance expands his narrative and then arranges it is the key to this film being so devastating. I recently rewatched Revolutionary Road again, which is an equally devastating story of a crumbling marriage set to the backdrop of 1950's suburban boredom. Revolutionary Road definitely goes to more extremes than Blue Valentine does, and comparing on paper, Blue Valentine has no right to be as devastating as it is. But just look at the final few minutes, which edit together Dean and Cindy's wedding day and the end of their marriage. The two parallel narratives are brought to a close together, giving a simultaneous happy end to one and a sad end to the other. And then there's that final shot of Dean disappearing into the distance and Cindy walking away with their daughter in her arms. Perhaps there's a little bit of cruel irony that Cianfrance chooses to set this scene with Dean walking towards the fireworks in the background, which then lead to the credits playing a slideshow of Dean and Cindy in happier times with fireworks all around them. After all, it is fireworks that start all of these things, isn't it? And Dean is walking right into them, even though the fireworks are all but gone from his life. Just as Cianfrance does with The Place Beyond the Pines, showing both the cause and the consequent effect in the future, here he shows the process of falling in love and the process of falling out of love. Not exactly new concepts, but the way that Cianfrance treats them is with this startling mixture of a little bit of romantic whimsy that has developed in filmic love stories over the years and the gritty realism that has become cemented in films of this kind. Of course, the romantic stuff isn't a hard sell considering we have Ryan Gosling in the lead role. However, this is lightyears away from his most famous work as everyone woman's dream lover in The Notebook. The character development, along with the stunningly real performances from Gosling and Michelle Williams are key here - instead of the film focusing on just the relationship between the two characters, it also focuses on what makes the two characters separate entities. This is something that's always kind of annoyed me about 'romantic' films about relationships: they're always so concerned with marrying the characters together without realising that the characters can each stand on their own two feet. A considerable amount of time is spent developing the characters - particularly Cindy, which makes it a little easier to understand just why they fell in love and why they fell out of love. Instead of fabricating the why into these grand romantic gestures straight out of a Nicholas Sparks novel, Gosling and Williams are masters of subtlety. Sure, it's subtlety that could be blown out of proportion by over-romanticised Tumblr kids, but it is a little more believable than some of the other syrupy stuff we see. It also works both ways - apart from the end, the other most devastating part of this film (I think) is the scene towards the end where Dean tries to hug Cindy and she just resists him. This one scene doesn't pinpoint one singular reason as to why they had fallen out of love, but instead shows how time has completely worn them down. Whereas that hug would have been welcomed back in the early days, its pretty much the most repulsive thing that could happen now. Since I've been watching The Disappearance of Eleanor Rigby's trailer at least 50 times per day (because THIS IS THE YEAR OF JESSICA CHASTAIN AGAIN!!! ), I've been getting a few Blue Valentine-ish vibes from that one. Mainly because Rigby looks like the definition of an expanded narrative. But hopefully my heart has healed up by then thanks to this little rewatch of Blue Valentine. Also, when you watch Blue Valentine and the remake of Endless Love almost back to back it kinda gives you a weird perspective on things. So I don't really recommend doing that. Not that any of you would be insane enough to watch Endless Love anyway. Great post! It's nice to think back on this wonderful film. It was heartbreaking, and I'm not sure if I'd ever want to watch it again, but it was so good. Cinematicparadox is the one of the well design and best website and from it we can find best content related to grammar, movies, reading, resources, writing, speaking, models and many more. For being an employee as a help with psychology assignment provider at Assignment Help Folks, I appreciates such kind of very well writing which is providing valuable information of movie Blue Valentine may not be the happiest experience, but it is an experience nonetheless. Thanks for sharing such a fantastic blog with us.
" I didn't really remember the magnitude of absolute earth-shattering devastation that this film brought to my world." AMEN. This is a beautifully shot film, but it's definitely filed in my most-depressing with no redeeming value category. I was just utterly devastated post-viewing that I've chosen not to re-watch it. Nice comparisons with the other films though! Nice write-up. I've seen seen Blue Valentine a couple of times, but I've not revisited it since it first came out on DVD. It really is almost too devastating to sit through. When are we going to know for sure?” she asked. He had no answer. They hung up. Five minutes later, Beth’s cell phone rang once more. “It’s a go,” he said they write my paper. Ten minutes after that, O’Reilly was teeing off. The score wouldn’t matter. How many putts per hole? Nobody cares. How far did he travel off the tee? Whatever. After writing college application essays topics, in free I like to watch movies, read books and travel. Just recently, once again revised the melodrama "Blue Valentine", which perfectly played Ryan Gosling and Michelle Williams, for which, in fact, and received in 2011 for the Golden Globe Award for the best male and female role. Delightful skills most suitable! Rather have feel reading all those daily. I’ve perfected rather a lot in that respect there. Regards a whole lot when indicating your blog. Already go along with right construction company NYC Quite advantages many people understanding how to come to be any eco-friendly.